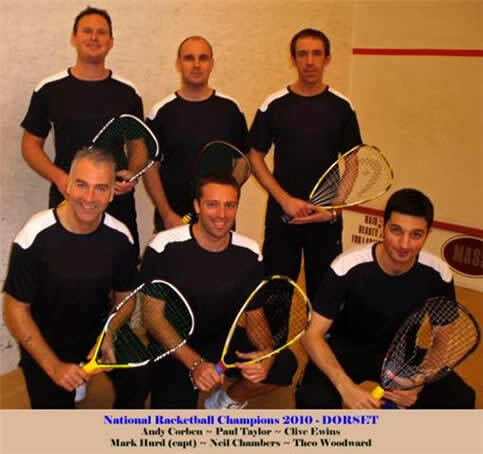 The Dorset Racketball team, travelled to Kent last weekend, with virtually the strongest team that Dorset could muster. Clive Ewins, Neil Chambers, Andy Corben, Theo Woodward, Paul Taylor and Mark Hurd (capt). Our first match, the semi final was against Yorkshire, a county steeped in squash history, who were they going to field? Well at the top of the order they had Jim Lord, National champion at O/35 and O/40, not a great omen. Fives and threes went on first with Paul Taylor totally outclassing Ian Cawthorne winning 3/0. One nil Dorset, Andy corben had a real tussle with Ben Brown but after a gruelling 72 minutes came through 3/2. Two nil Dorset, Theo Woodward who would make a habit of putting his team through the wringer this weekend took on Mike Tolman who fought well, but just couldn't get ahead of Theo in the fifth.Three nil Dorset, and we were through to the final. Still two strings to play though and both Neil and Clive wanted to show us what they could do. Clive took on the brilliantly talented Jim Lord and played immaculate racketball to beat the age group national champion 3/1. Four nil Dorset. Neil had no problems taking out Neil Guirey in just 28 mins. Five nil Dorset. Dorset had made it through to the final in fine style and waiting for them in the final was a very strong Devon team who had taken out last year's national champions Kent 4-1. Mark Hurd team (capt) had his work cut out trying to keep our boys out of the bar after celebrating our win over Yorkshire, but after a quiet curry at the club and a few bribes, he had all of the team back at the hotel by 9.50pm. Unheard of in Dorset inter county history! Dorset had decided to field an unchanged team for the final, even though Paul Taylor had spent a lot of the previous evening suffering from a stomach upset. Paul Taylor and Andy Corben were first on again, and this is where Dorset's dreams started to unravel. Paul had a tough first game losing out 11/9. After that Paul's weakened state left him in a vulnerable position and he quickly lost the next two games. Devon one nil. Meanwhile on the next door court, Andy was having an attritional battle with Christian Turner. Andy managed to get to one game all, but Christian was just too steady on this occasion and won a tight match 3/1. Devon two nil. Dorset are now in trouble! Next up Theo Woodward against Gavin Perrett. This was a must win match to keep Dorset alive in the final. Theo started well and took the first game 12/10, Perrett steadied up and took the second 11/8, Theo then came out fighting and took a tight third 12/10, all to play for now and Devon levelled the match 11/2. Perrett started well and rushed to a 9/4 lead in the fifth, (at this point Clive was warming up on the next door court expecting to be playing a dead rubber). Somehow Theo managed point by point to make a comeback and after some nervy rallies managed to bring the scores level at 9 all, this had been a gruelling encounter and it was now anyone's game. Theo buried a brilliant volley to go to match ball, the rally was just developing when Theo played an inspired shot through the middle of the court, which hit his opponent and took the match, after 72 mins, a brilliant effort Dorset 1 Devon2. Game on! I would just like to finish this match report off with a few thank you's. Missing from the team for the Final were Alexis Smith, Simon Brown, Colin Bunch and Jamie Broomfield. Without these players we would not have got to the final, so this title is also firmly their achievement as well! A special thanks also goes to David William who came and supported for the whole weekend and is also responsible for the photography. Finally I would like to thank the Team who played at the weekend, they were supportive of their fellow teammates to the last, and bonded immediately, making my job an absolute breeze.